» Try out our new bike calculators! Tyre Pressure, Chain Length, Frame Size & more » Try out our new bike calculators! Tires are extremely important for the road grip of a bicycle, since the treads are the only points of contact with the ground. There is a great number of highly specific tyres for every field of application. 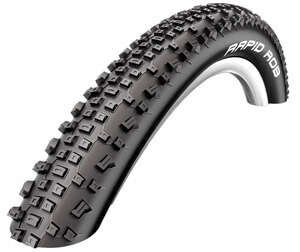 Fatbike MTB tires and plus-size tyres are only two of many new classes of products. The individual tyre models could not be more different: On the one hand, there are downhill tyres with rough treads, large diameters, and soft rubber compounds, and narrow road bike tyres with little rolling resistance on the other hand. But don't worry, here is an overview. Many bike tyres come with tubes that hold the air. Bike tubes are available with different diameters, widths, wall thicknesses, and valve systems. A tube's diameter must fit the rim, and its thickness depends on the tyre. In terms of valves, you can choose between Dunlop valves, Sclaverand valves (racing valves, French valves), and Schrader valves (car valves). Schwalbe offers a well organized range of bike tubes. Many mountain bikers value tubeless tyres, which come with a sealing fluid instead of a tube. They are lighter and also have the advantage of higher protection against puncture. 28-inch tyres for road bikes provide minimum rolling resistance and a minimalist tread. They are designed for high-speed rides and firm grip in bends and on wet grounds. Tubular tyres are sometimes used for road bikes but first and foremost for cyclo-cross races and track racing. They are glued directly on the rim and don't require a tube. For reasons of weight, most cyclists prefer folding tires to heavy clincher tyres. 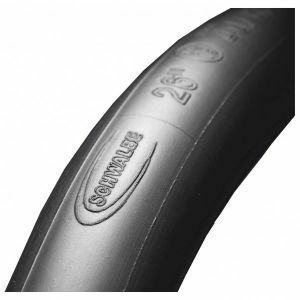 Manufacturers like Schwalbe and Continental offer tyres for road bikes and cyclo-crossers. Trekking bike tyres are suitable for many different grounds and therefore provide a good balance between rolling resistance, grip, and sufficient protection against puncture. Many trekking tyres are clincher tires as their weight doesn't play an important role. Special models come with maximum puncture protection, which makes them perfect for everyday use. Mountain bikes tyres cover an enormous range of application areas. They are available with 26, 27.5, and 29-inch diameters. It is very important to choose these tyres in accordance with the intended purpose and find the perfect balance between weight, rolling resistance, and puncture protection. Many cyclists choose rear tyres made of hard rubber compounds and soft compounds for their front tyres in order to reduce the rolling resistance to a minimum and achieve a good brake effect and cornering ability. The thicker a tyre, the larger the contact surface and the better the damping. However, the tyre is heavier as well. Rough treads sink deeply into muddy soil. Wide treads allow the tyre to clean itself more effectively. Downhill tyres are equipped with particularly rough treads and sturdy flanks, which raises their puncture protection. Tyres for cross-country racing are light and fast. Their tread is fine and guarantees minimum rolling resistance. All-mountain tyres and Enduro models are located between DH and CC tyres. The Tubeless Easy technology by Schwalbe makes it easier to assemble tubeless systems. Thus the weight is reduced to a minimum and 2.4 tyres can be filled with only 1.2 to 1.5 bars of pressure, which improves the tyre's traction. Tubeless systems minimize the risk of puncture. Thick balloon tyres with strong treads are rather special tyres used for fatbikes. They generate enormous traction and high damping values. So which tyre is the right one now? The perfect bicycle tyre suits its area of application, the soil, and the terrain. If you use your road bike under diverse conditions, you should think about different sets of tyres and wheels in order to adapt your road bike to different purposes. Tip: If you don't want your road bike ride to end at the first loss of air pressure, take a puncture repair kit, a bike pump, and bicycle tools with you in your backpack. "I&apos;ll find the best & latest outdoor products for you!" Based on 9614 seller reviews at Trusted Shops, alpinetrek.co.uk has received an average 4.77 of 5 stars.